Varieties of this species vary from upright to weeping and foliage and stem color can vary as well. All tend to leaf out well before other trees in spring and hold their leaves much later in autumn. Salix thrive in wet soils. 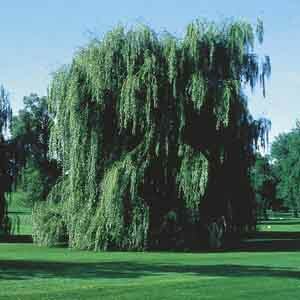 Also commonly known as White Willow. A classic favorite for landscape focal points. Perfect for use in swampy areas and areas around ponds, lakes and streams. Provides shade and large-scale beauty to landscapes. Plant in a reliably sunny spot. When planting, keep the base of the trunk exposed. Best in fertile, humus-rich, well-drained soil. Keep soil moist, watering freely in dry weather.